Aislinn is an engineer at heart, after 15+ years she's still as passionate about her role in the software industry as she was on day one. Aislinn has led scaled technical teams to deliver software solving real world problems for citizens today. Her current role involves both leadership of continuous improvement for technologists and supporting the Digital Services delivery teams in achieving success. Aislinn is also a keen advocate of the NI IT community and contributes to various events including curating the Engineering stream for Belfast's biggest IT conference; BelTech. Random fact: Aislinn’s first real job was working in a greasy spoon, fuelling Belfast bus drivers with sausage butties! Don't miss out, grab your ticket now! I’m Kezie Todd, but you can call me Kez. I’m an all-round geek who went from a self-taught designer to studying interaction design full time. Education in six different countries helps me bring a new perspective to any project and motivates me to design to delight the globe. You can find me UXing things on placement at Puppet when I’m not dying on the five-a-side pitch or as @sayskez around the web. Random Fact: I never studied art or design before university, instead little me was too busy preserving bugs in the freezer and dreaming of becoming an entomologist. Claire is a frontend developer with a passion for accessibility, currently working for Bazaarvoice Belfast. 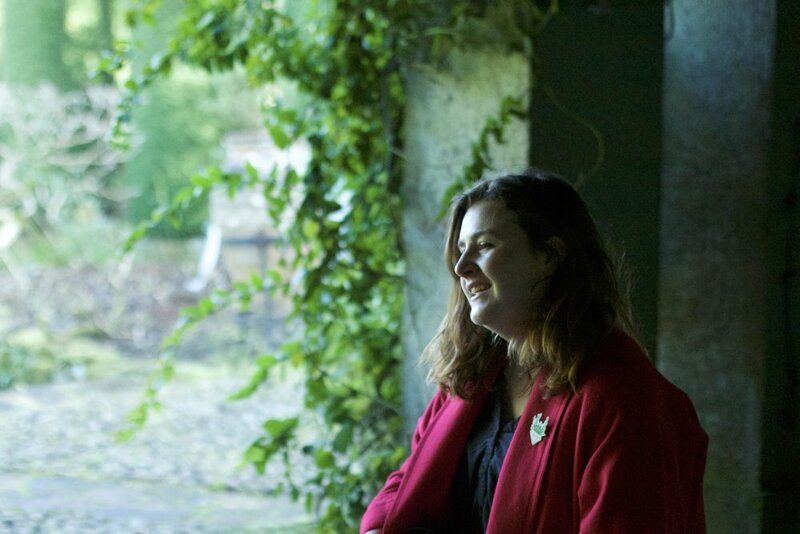 She is an avid speaker at conferences & meetups, and organises local events and groups such as Women Techmakers Belfast, Women in Tech Lean In Belfast, Global Game Jam and BelfastJS." Her favourite hobby/thing to relax is painting my nails and doing nail art. art through the use of technology and computer coding. 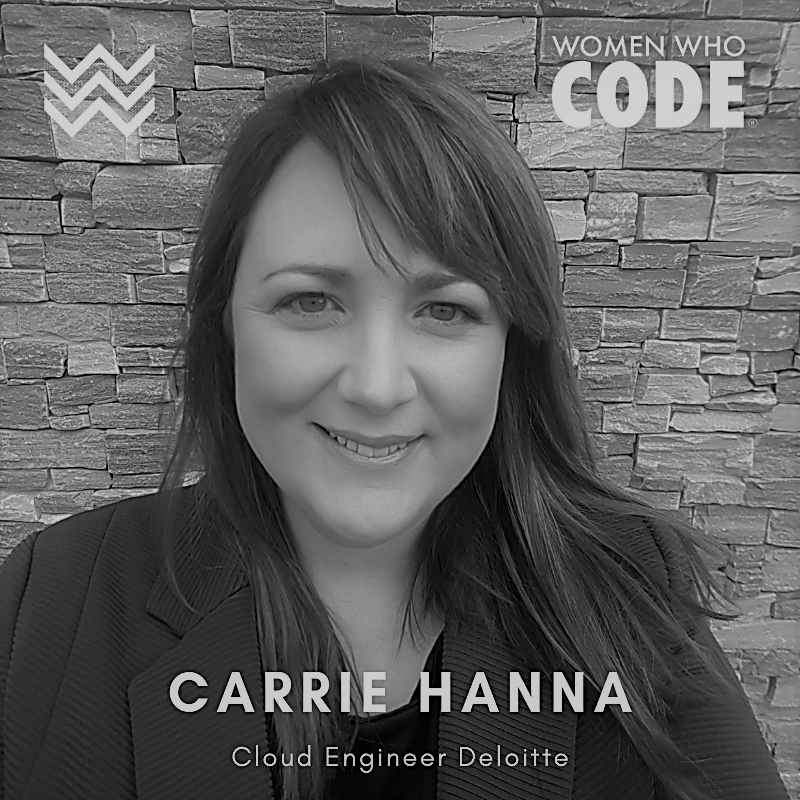 Hi, I'm Carrie and I'm a Cloud Engineer at Deloitte. My career path has been a curvy one through 3 countries and several industries. I'm a former Chemistry graduate and scientist in nuclear safety engineering. About 6 years ago, I moved home to NI and did quite a few roles in lots of different areas of STEM education. I joined the 4IRC programme at Catalyst in 2016 and I met a lot of brilliant people in the Belfast tech ecosystem. Last September I got a place at the Deloitte Cloud Academy and now I'm working in cloud architecture and platforms. It has been the learning journey of a lifetime! To keep the balance, I do yoga, meditation, singing, dancing and energy healing therapies. The lightbulb moment at start of my quest to tech was Design Thinking. Collaborative, creative and communicative problem solving. It's been a game changer for me. For International Women’s Day 2019 we will be hosting a meet up to launch our new online publication promoting women in design (kindly funded by Belfast City Council) and our new mentoring program. We will also be hearing from Hannah Sharp on her new project Make Your Mark a book dedicated to talking about the design industry from a female designers perspective. Let’s build Belfast out of cardboard boxes and a range of other exciting materials. What would you add to make the city better, what might you take away? Help create a 3D map of this city. Design Our Future… What do you think our next story should be? This workshop will focus on book design and storytelling. There will be a brief introduction to the different stages of book making. This will include brainstorming ideas, storyboarding, weaving text and images together, dummy book making, the process of working on a final book itself and tips on how to work in the publishing industry. Womenfolk, Creating A Space & Blick Shared Studios have teamed up to create a unique interactive event with a panel of female design students talking about their experiences and journey in the design industry/education to date and what their plans, ambitions and aspirations for the future are. Womenfolk Exhibition is Launching as part of ​Belfast Design Week on 6th November and finishing on International Women’s Day 8th March 2019 this exhibition will be a celebration of Belfast’s female design talent. The exhibition will launch in ​Castle Court as part of Belfast Design Week. This will be the fourth in our series of breakfast events hosted this time by Kaizen where a senior designer from the company shares the story of their career path to success. Complimented by a young emerging designer from the company starting out in the professional world, telling their story so far and the challenges they face. Junior.Senior aims to open the floor (and the doors) to the world of Junior.Senior. female designers in Northern Ireland. Create collaborations and help champion young emerging designers. 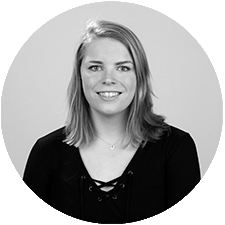 Marie-therese is UX Lead in Fathom, a human experience agency based in Belfast. She has worked on major projects north and south of the Island of Ireland's capitals. She leads her multi-disciplinary team across user experience and service design projects which span sectors such as Banking, Healthcare, Start-ups and the Public Sector. Building a healthy design culture for her team which helps foster creativity for her clients, is a key motivator for Marie-therese. Junior.Senior. July – the second in our series of breakfast events where a senior designer shares the story of their career path to success. Complimented by a young emerging designer starting out in the professional world, telling their story so far and the challenges they face. Kim Hetherington is founder of Little Designs, she started her digital doodles in 2017 and has been creating cute things ever since. Lisa Smyth is a creative design consultant and business owner with a 1st class honours degree and almost 20 years of professional experience in the field of graphic design and branding design. Lisa previously worked for large design and advertising agencies in Northern Ireland, Scotland and London. Previous to shesaid Lisa Smyth has been a sole trader at mrssmyth.co.ukfor the past ten years. Lisa works with business and organisations who like to build a relationship with a dedicated designer to turn their business goals into reality. Mrs Smyth’s aim is to assist the growth and success of a clients business through great design. Lisa has been providing design and branding services to a diverse range of clients across the Voluntary and Private Sector. Lisa has collaborated with other design agencies working on branding projects for Channel 4 and Discovery Channel. In 2017 Lisa was part of the core design team in the redesign of the new polymer Ulster Bank notes. Working for service design agency Nile (Edinburgh) and branding agency O Street, Lisa worked as part of the design team in accumulating insight and developing networks of Northern Ireland expertise. Lisa was also integral to the creative direction through the concept phase. Lisa delivered conference pitches to the Royal Bank of Scotland representing the ‘voice of Northern Ireland’. Christine McKee has over 15 years professional experience having worked in some of the top design agencies in Belfast, such as AV Browne, Slater Design, McCadden Design, Tandem Design and formerly Whitenoise. Her expertise spans from creating corporate identities for small and large businesses, to print, exhibition design and retail. Christine has worked with companies such as the Open House Festival, Newcastle Evolution Festival, Lloyds TSB Foundation for Northern Ireland, Belfast City Council and a wide range of smaller businesses. She has recently won an account for Ormeau Credit Union. The new brand identity reflects how community finance is seen in nature, just as bees work together as a cooperative for the mutual benefit of the hive. Strategic design lead thinking has brought the concept to life through their visual language and customer perception. Aisling Rusk is the founder of Studio idir, a small, design-led architecture practice that flourishes in the in-between. Aisling is interested in the impact that the built environment can have on the negotiation of difference within societies that are in or moving out of conflict. She is also interested in liminality, or practices of locating in-between, particularly in divided and contested contexts where divisive binaries are rife. Gemma O’Neill is an illustrator/author from the Causeway Coast, now based outside Belfast. When she graduated from Falmouth University in 2011 she already had her first authored and illustrated picture book deal which has been published globally and received many award nominations. Although originally specialising in children's book illustration, she now also enjoys factual and adult illustration, creating greetings cards, prints and original artwork. Her Causeway Coast roots are of huge inspiration in terms of mark making, colour and the natural theme within her work. Karen Miano is the Co Founder of DIAxDEM. “I Remember distinctly when I started out in the creative industry, specifically in music management, being told that my place within the industry would eventually sit and fit into being a facilitator. Now I have no problem with that, but the issue is that men tend to dictate women's narratives within the creative community and we get lobbed into being the facilitators 7 times out of 10. I think all that is changing. Women are much more receptive to relatability and art (in whatever form that may be) is a huge way of connecting and bringing us together to share stories and ask questions. I hope to work on connecting the two roles of Facilitator & Creator, and to inspire young people of colour to feel empowered to follow their creative spirits!" Geri Doherty is a TV/Film industry professional wth extensive experience as a costumier / stylist. Is a founding member and producer of Melt Fashion Collective, advocating for NI underground creative talent with the aim of nurturing expression of self, fashion as an art form and grounding a DIY/inclusive ethos. She loves all things spirtual and is obsessed with perfume.